The Cyclone foosball table has a heavy cabinet and is a full size foosball table made by the Fat Cat company. 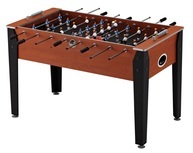 This table is known for having a light cabinet design accented with some metallic-looking foosball parts. 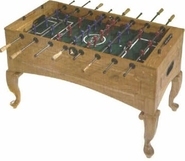 This table features wooden rods, robot style foosball men, adjustable legs, beaded scoring system to 10, and a side ball return. 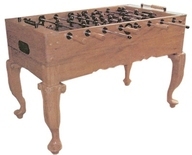 This table also has the nick name, "Continuous play" because it has rounded foosball table ends that keep the ball always rolling. 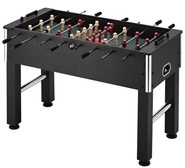 This also helps from the ball bouncing off the table as they sometimes do when you have extremely hard foosball shots. 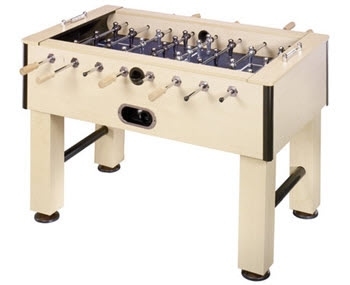 This foosball table is priced at around $550 US.